Ballots sent from outside Quebec must be received by Elections Quebec by 8 p.m. April 7. Editor’s note: The original version of this corrected story had incorrect information in the subhead. Details below. MONTREAL — Snowbirds hoping to cast their ballots in the coming provincial election from afar ran into some early challenges on Thursday, despite new rules designed to make the process easier. With the campaign in full swing back home, many Quebecers who spend the harsh winter months in warmer climates logged on to Elections Québec’s website to begin registering to vote by mail. 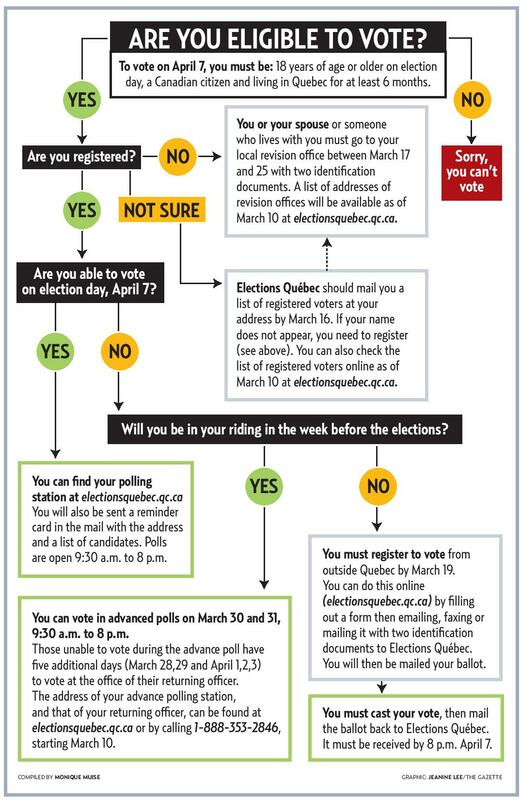 The process itself is fairly straightforward: Eligible voters fill out a form, which can be mailed, faxed or emailed along with two pieces of identification to Elections Quebec by March 19. The ability to email the information (with scanned copies of the documents) is a new feature put in place since the last provincial election in 2012. Once the application is received and processed, the voter gets his or her ballot in the mail wherever they happen to be staying. The ballot must reach Elections Quebec by 8 p.m. on election day (April 7). Any vote that isn’t received by that deadline will not be counted, so people like Jean Prevost — currently wintering in Florida — wanted to get a head-start on the process this week. Almost immediately, however, there was a technical glitch. The French application form could easily be downloaded, but the link to the English version turned up an error message. “I tried on my Mac, my Mac Air, my iPad, and a few friends on their PCs,” a frustrated Prevost said in an email to The Gazette early Thursday. Within 30 minutes, the glitch was no more. Meanwhile, Elections Quebec held a news conference on Thursday morning to unveil an advertising campaign designed to encourage more Quebecers to exercise their right to cast a ballot on April 7. The participation rate in the last provincial election was 74.6 per cent, the highest rate recorded since 1998. Our mobile readers can click the link at the end of this story to access the Elections Québec website. 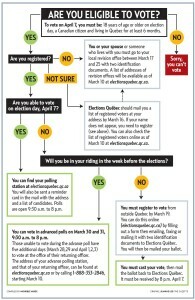 CORRECTION: The voter registration form must be sent to Elections Quebec by March 19. Incorrect information appeared in the subhead of the original version of this story.